Once downloaded, both programs can be saved to your computer and used without an internet connection. The programs allows users to view the validated dynamic model weight change predictions (1) in response to changes in dietary intake or low doses of exercise. Weight graphs are automatically rescaled with print-ready capability. The excel file which simulates the dynamic model (1) is macro enabled. When you download the file you will be prompted to “Enable Macros”. Select yes and you will be ready to use the program. 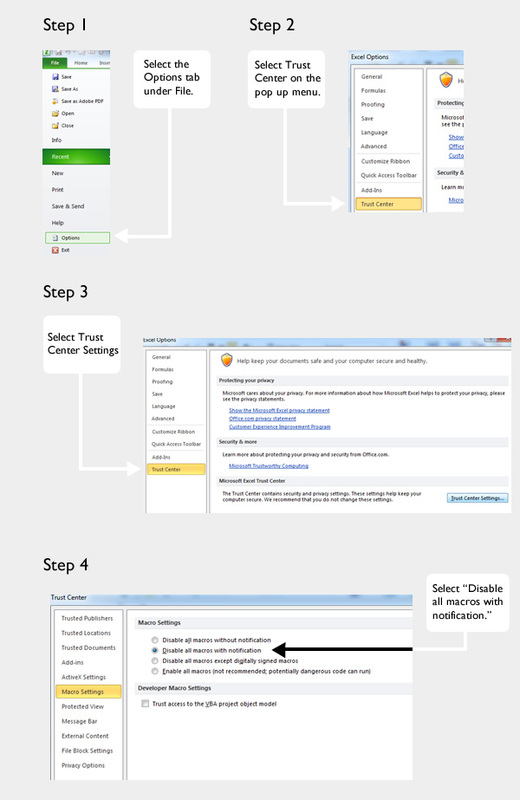 If you are not prompted upon download to enable macros, open Microsoft® Excel on your computer and follow the instructions here to enable macros. If you own a PC, then you will need Microsoft® Excel Version 97-2003 or newer. The Java program requires that Java (freely available software) to be installed on your computer. If your computer is not equipped with Java, click here. If you require instructions to run the Java program, click here. If you wish to view the video tutorial on the Java program, click here. Download and save the Java program file. If you don’t see the Java logo (coffee cup with steam), your computer may not have Java installed. To download Java, click here. To change any baseline options, click on the tools. To change intake at any week, manually type in your changes. To view 3500 kcal Rule predictions simultaneously with the dynamic model predictions or to change intake units to MJ/d, select the option tool in the menu at the top of the calculator. If you extend the graph past 6 months, click the graph and select the desired time length. You can print your graph by making this selection from the menu. If you need more guidance, we have additionally prepared a video tutorial video tutorial. 1. Thomas D.M., et al. A simple model predicting individual weight change in humans. Journal of Biological Dynamics. 2011;5(6):579-99.